Dimensions: Clock: 22.2″ X 9.8″ X 31.2″ h Base: 30.4″ X 16.4″ X 48.4″ h.
Ashanti Interiors is proud to introduce this Art Inlaid Clock by hand with semi-precious stones (natural gems – Warranted) 24 karat gold plated brass decorations. Design of Giovanni Battista Foggini and Balthasar Permoser, before 1689. Gemstones used are Lapis lazuli, Rhodonite, White agate, Nocaite, Opalite, Ucanite, Chrysocolla, Jasper (red, grey, grey, green, heliotrope,) Jade (green, pink, nephrite), Rhodochrosite, Silicized fossil wood, Yellow syenite, Labradorite, Paesina stones, and Turquoise. A real jewel of a family heirloom for generations to come! Offering price $47,995.95. If you wish to speak with a customer service representative to order by phone or request additional information please call toll free 866.382.4907 x101 or email customerservice@ashlijewelers.com. Clock: 18.3″ X 9.8″ X 37.1″ h Mobile Base: 31.2″ X 14″ X 43.7″ h.
If you wish to speak with a customer service representative to order by phone or want additional information please call toll free 866.382.4907 x101. There are still custom clothiers, shirt makers and boot makers but the common notion of custom made has essentially vanished. This has meant the disappearance for the vast majority of local watch makers and jewelers, custom dress and shirt makers and other custom made products. 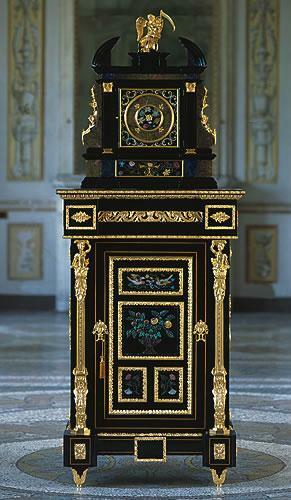 Not with this Italian maker of Art Inlay Clocks and Furniture. 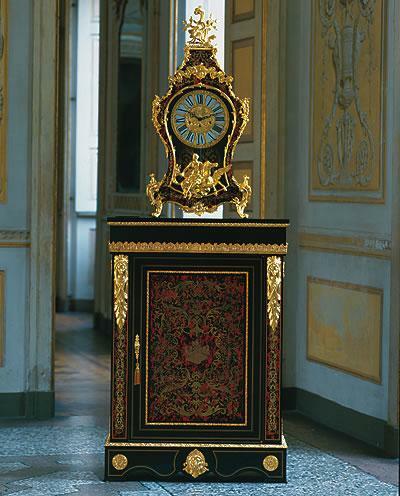 Ashanti Interiors is honored to inform that we are offering a restoration of a beautiful and rare Louis XIV style pendulum clock (1643 – 1715), which was created by the famous furniture maker M. Passerat. Permission has been given to reproduce this clock, only in a limited quantity. In reconstructing the pendulum clock the reproduction of this clock will follow the techniques used by the ancient masters respecting the choice of quality materials. 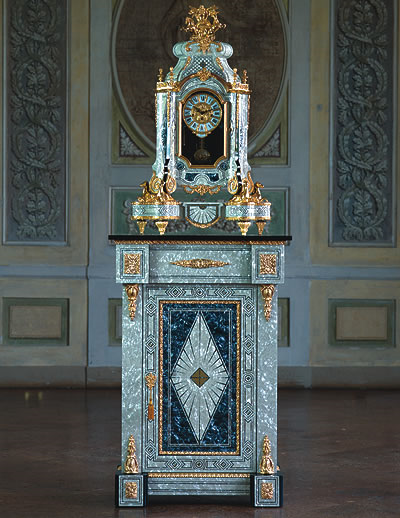 The inlay has been exactly reproduced by hand using the Charles-Andre Boulle Style (1642 – 1732), and enriched by the use of superb engraving. The bronze decorations have been made in “lost wax” (the ancient way) and plated in 24kt gold. They have been chiseled by hand adding prominence to all the details and giving it an unmatched great artistic value. Due to the limited quantities being produced (every piece with an individual number) and letter of authenticity, we are offering this unique opportunity to only those guests who we know that would be able to estimate the preciousness of this time piece. Offering Price is $24,995.95. If you wish to speak with a customer service representative to order by phone please call toll free 866.382.4907 x103 to speak with a customer service representative.